Our neighbors are the best! In the summer we are the lucky recipients of fresh produce from their gardens. And at Christmas we get homemade goodies. Kenny and Phyllis brought us homemade salsa with some chips - DELICIOUS! Jim and Becky brought us some of their incredible homemade cannelloni in a lovely homemade tomato sauce. And Dan and Dianna have delivered a jar of beautiful black bean salsa with a bag of red and green tortilla chips - and - these yummy chocolate turtles. When she told me how easy the recipe was for the turtles, I made her bring the whole container over for a picture. I just love recipes that are so easy to make and so delicious and so cute! We feel fortunate to have found neighbors like ours who know that simple, homemade Christmas treats make the best gifts ever! Oh, and we're giving them each a bag of Sugar and Spice Pecans, of course. Great minds think alike! On a baking sheet, place two pecan halves side by side (touching). Place a Kraft caramel on top of the pecans (in the center). Place another pecan half on top, pressing down to smash the caramel. Refrigerate these for awhile for easier dipping. In double boiler, melt the semi-sweet chocolate chips and paraffin. Dip turtles in chocolate and put on wax paper to set. Gobbled enough turkey? Stuffed full of dressing? Side-lined by heaping dishes of potatoes, corn and cranberries? Rich and delicious holiday foods sometimes need a little something to lighten things up a bit. We always have a fresh green salad at our holiday meals, and our favorite is known to us as Sandy Salad, named for my sister-in-law-in-law who makes it for family gatherings. Her sister, my sister-in-law, now makes it for our family gatherings. Even if you are confused about the familial relationships here, don't be confused about this salad. It is always a big hit and, in fact, is something many of us crave when there are a few too many good, rich dishes on the table. I also crave it in the middle of winter, when a big bowl of lettuce can be like a mini vacation to warmer climates, especially with some grilled chicken or shrimp on top. 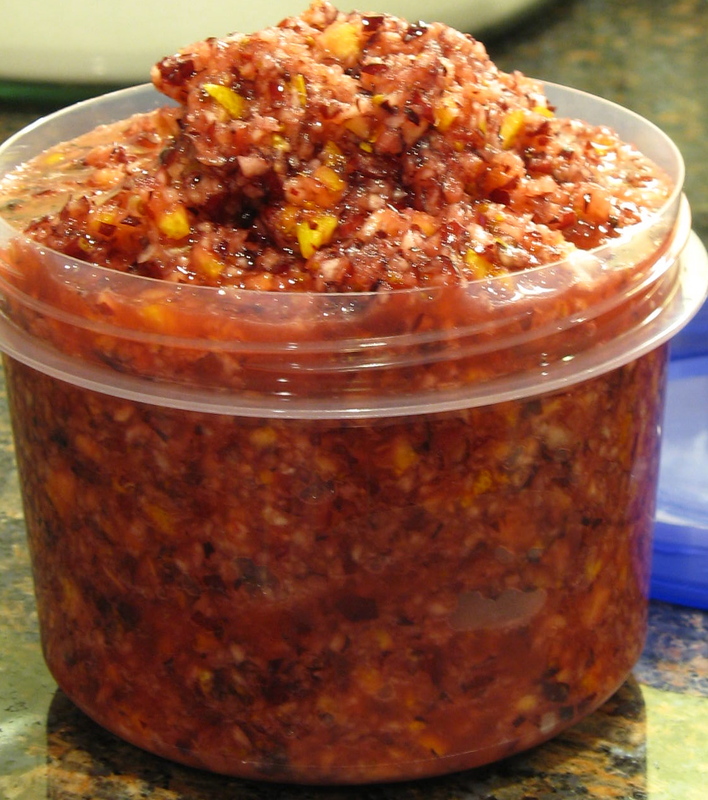 Mix dressing and refrigerate for at least 24 hrs. Chop lettuce, onion and pepper. Fry wonton wraps in oil over medium heat. Drain and cool. Break into bite size pieces. Toss everything with dressing just before serving. Note: This is a perfect make ahead and take along dish. Store the dressing in a jar at room temperature. Store the crispy fried wontons in an airtight bag or container at room temperature. Store the salad chopped ingredients in a bag in the refrigerator or in an insulated cooler. When ready to serve, just toss ingredients together in a big bowl. Wow! I just noticed that this is my 100th post! Hooray for me! When I realized it was only eight days until Christmas, I knew it was time for this particular Menu Wednesday. Besides being short, sweet and easy, it works for almost any meal or entertaining you have planned for these last few busy days before Christmas. And maybe the best part for me when I make both of these dishes is remembering my friends Pat and Gayle, who gave me these recipes so long ago. I am fortunate to still count them as friends, and even though I don't see them as often as I would like, at this time of year I look forward to receiving their Christmas cards and catching up on their news. Friends - and recipes! - are truly gifts that keep on giving! Next Wednesday will be Christmas Eve and I'll be working all day at my 'shop girl job' and then having a quiet dinner with my parents, my brothers, my sister-in-law, and of course, My Favorite Husband. The newlyweds will be with Kristen's family for Christmas Eve, and then with us on Christmas Day. I'm sure all of you will be as busy as I am, so we'll be taking a day off at Menu Wednesday. Check back here on New Year's Eve though, to see what we'll be serving up for 2009! Until then, take a look at the recipes for Quiche and Hot Baked Fruit AND have a Holly Jolly Christmas with your family and friends, near and far! 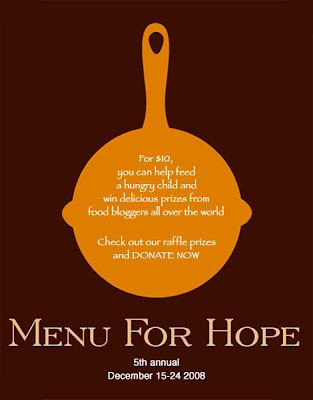 I promised you more information about the participation of Cora Cooks in the food blog fundraiser known as Menu for Hope V - so here it is. This is the fifth December that Pim Techamuanvivit, who blogs about food from around the world at Chez Pim, has gathered her food blogger friends to help raise money for a worthy cause. Last year's raffle raised over $90,000! Of course, since we are food bloggers, we want to help with - what else - FOOD! So, by donating all manner of interesting food related items, and then posting the raffle on our blogs, we share comfort and joy with food. This year, for the second year in a row, donations will go toward helping the UN's World Food Program feed lunches to hungry young school children in Lesotho, South Africa. 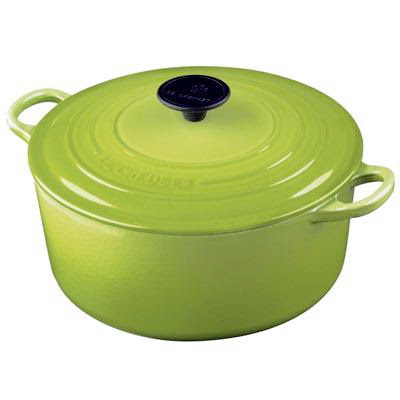 As a new-ish food blogger, who has only met a few of my fellow food bloggers in person, I am so honored to offer this beautiful Lemongrass Le Creuset 5 1/2 qt. Dutch Oven - remember #UE21 - for the raffle, and a chance for my fantastic readers - that's YOU! - to participate too! 1. 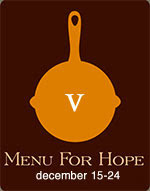 Choose a prize or prizes of your choice from our Menu for Hope. The Cora Cooks prize is #UE21. 3. Each $10 raffle ticket you donate will give you one chance toward a prize of your choice. Of course, you can purchase as many chances as you like. Please specify which prize you'd like in the 'Personal Message' section on the donation form when confirming your donation. You must write-in how many tickets per prize, and please use the prize code. 4. If your company or employer matches your charity donation, please check the box and fill in the information so we can claim the corporate match. 5. Please allow us to see your email address so that we can contact you - just in case you WIN!. Your email address will not be shared with anyone. 6. Winners will also be announced on Chez Pim in January. Or, if you're ready to give now, just go to our donation site at FirstGiving. This year I am hopeful the readers of Cora Cooks will join in this wonderful opportunity to help Pim and this community of food bloggers to give the gift of food to the United Nation's World Food Program. Sugar & Spice Pecans are one of my Christmas essentials. I usually order a big box of pecans from Georgia and make batch after batch for gifts and for keeping. If I store them in airtight containers in the freezer, they last all year and are handy for snacks, hostess gifts and especially adding to salads or ice cream. Pack them is small decorated clear cellophane bags and add one to your wrapped gifts as an extra touch. Fill a big basket of little bags of Sugar & Spice Pecans tied with pretty ribbons and hand them out to the mail carrier, UPS driver, FEDEX driver, florist delivery person or anyone else who comes to your door during the holiday season - a wonderful thank you for all their hard work helping Santa to make all our wishes come true. Combine first 8 ingredients in a very large bowl; mix well with wire whisk. Add pecans; stir until evenly coated. Spread pecans into a greased 15x10x1” jellyroll pan. Bake at 275 degrees for 50-55 minutes; stir once while baking. Remove to waxed paper while still warm; cool. Store in an airtight container. These make a great gift in pretty cellophane bags tied with ribbons. Serve in a bowl for snacking, in salads, or on top of ice cream. Hello there! I've already got the menu ready for this week. Please don't worry about how tired I'll be at work tomorrow. This week's menu is especially for my favorite painter who is down in Costa Rica enjoying warm weather and fresh fish. I'm sure he's looking for some new recipes - either that or there is someone else reading my blog in Costa Rica! If you've never tried fish tacos, you are in for a treat! During the summer, I like to cook the fish and warm the tortillas on the grill, but they also cook up very nicely when sauteed or baked inside. In Mexico, this is street or beach food and doesn't really need any side dishes, but for eating at home, I've added some delicious and nutritious pinto beans and a little dessert to complete the menu. Do you think Eldon will make these for his friends in Costa Rica? By Sunday morning, we were down to the nubs of Thanksgiving leftovers. My brother-in-law, Scott, was determined to throw everything together for breakfast -- and boy did he! He used a wide variety of leftover bits and pieces from some really great holiday meals to create an absolutely delicious - and beautiful! - frittata. While this particular one can never be duplicated exactly, it is still worth mentioning the combination of flavors and technique to point out how easy it is to use up bits and pieces of seemingly unmatched foods and turn them into something wonderful. I'm sure you'll be sorry you don't have some of these same leftovers, but open up your own fridge and have at it. It was a delicious brunch, but it would also be a great dinner of leftovers. Thanks Scott! In a large non-stick frying pan, saute hard salami for a minute or two, then add ham, then add turkey, then add barbecue pork and continue cooking for another minute or two until hard salami begins to brown. Add vegetable bits and saute briefly; pour meat and vegetable mixtures into a bowl and reserve. Beat eggs in a bowl and pour into same frying pan; stir and scramble over low heat until partially cooked. Add reserved meat and vegetable mixture over top of scrambled eggs, so it looks like a pizza. Cover eggs and continue to cook over low heat until set - about 10 minutes. Remove cover and continue to cook until all liquid evaporates (cut small slits with the corner of a spatula all around the frittata to release the moisture from underneath). Slide frittata onto a plate and slice into wedges to serve.